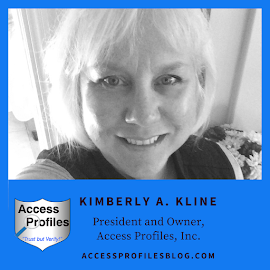 Access Profiles, Inc.: Job Seekers: Do You Have a Criminal Record? Find out the Best Time for You to Tell Your New Employer! 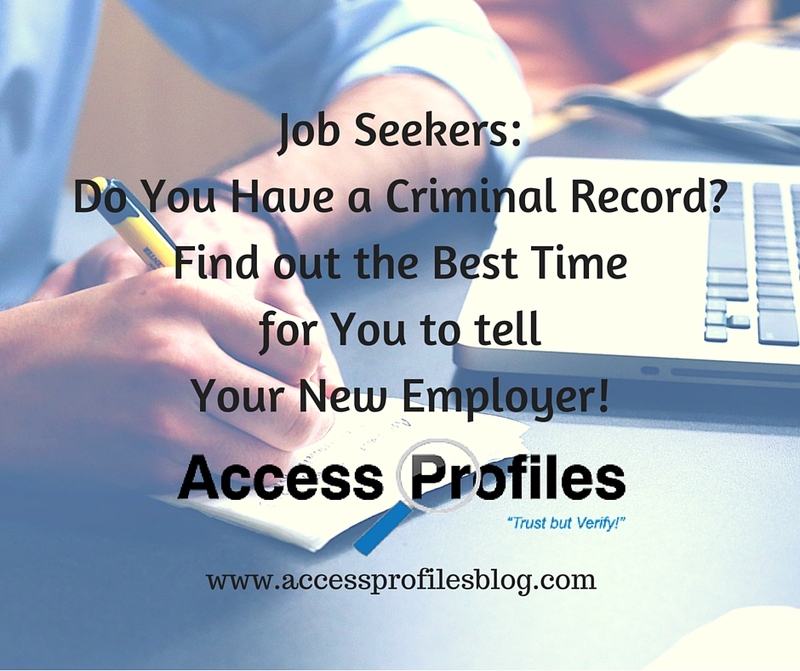 Job Seekers: Do You Have a Criminal Record? Find out the Best Time for You to Tell Your New Employer! Finding a job is a lot of work. And if you have a criminal record, the entire process becomes even more difficult. In this challenging job market, many ex-offenders feel like they don't stand a chance against job seekers with clean records. It is important to keep in mind that most employers will screen for criminal history. Existing “Ban the Box” laws and other guidelines may dictate when and how employers can use that information, but being screened is still a reality for anyone seeking employment. That is why it is important that you deal with your criminal record head on! One of the most common areas of concern for ex-offenders is whether or not to Self-Disclose their criminal past. Laws exist that dictate when and how an employer can use your criminal record in deciding employment. It is important to remember that those laws are there to protect you. Equal Employment Opportunity Commission (EEOC) Guidelines state that you cannot be denied employment based solely on your criminal record history (except in certain industries as required by law). Instead, an employer’s decision whether or not to hire you must be based on “business necessity”. The nature and gravity of your offense or offenses. The time that has passed since your conviction and/or completion of the sentence. The nature of the job you are seeking. Learn more about criminal histories and hiring here! Despite these protections, many ex-offenders are still worried. You may think that it is better to just stay quiet and take the chance that your past will not be uncovered. Instead, the smartest thing you can do is be open and up front about your criminal history. The important questions then become; When, What, and How to do it right! When Should You Tell Your Potential Employer about Your Criminal History? The best time for you to self-disclose is either after the interview (if an interview is part of the hiring process) or when you receive a conditional offer of employment. In either case, by then the employer has had the chance to get to know you, access your skills, and is interested. 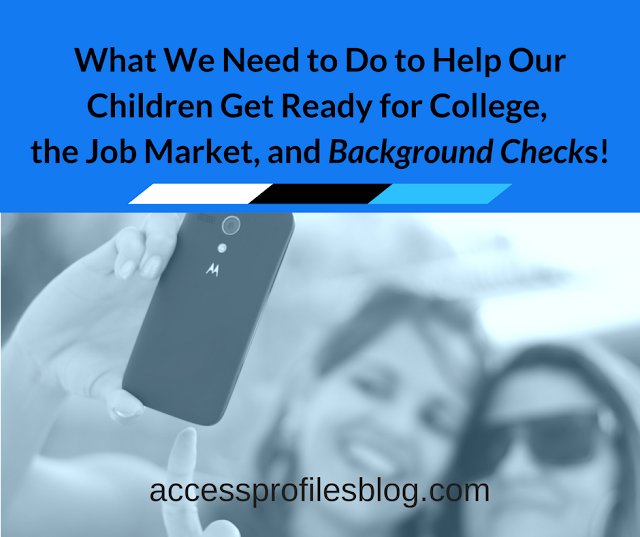 And in most cases, it is at this point when a background check is imminent. That is why taking the time now to talk about your criminal past makes sense. What Should You Disclose about Your Criminal History? Convictions that occurred in the past 7 to 10 years. Current employment laws and guidelines have focused on the validity of using convictions and not arrests as part of the employment screening process. In most cases, that is where your potential employer will place the greatest weight. You can find out more about Convictions vs Arrests in Employment Background Checks here! How Should You Explain Your Criminal History to a Potential Employer? My #1 recommendation is that you focus on what you have learned from your past. Take responsibility and be ready to explain any circumstances that lead to you committing your crime(s). When you are truthful, it is much more likely that the employer will put your past in context. But don’t let your conviction be the focus – stress what you’ve learned from the experience. Take this time to explain what you have done to reform. Share clear examples of any training programs you have completed or any certificates you have earned (even those earned while you may have been incarcerated). You should also include any letters of recommendation from employers, mentors, or even support group leaders. Be sure to emphasize any examples of your reliability and trustworthiness. What your potential employer is really looking for is anything you have done to show you have moved on and have done the work to improve yourself. While sharing this personal information may be difficult, it can go a long way towards getting you a second chance and showing you have moved on. For many employers, finding out you lied can be a bigger deal breaker than discovering you having a criminal history. That is why being prepared and ready to take responsibility is crucial. Employers realize that not everyone looking for a job is squeaky clean. So when you take it upon yourself to be open up front about what you have done, they are more likely than ever before to give you a second chance. Bottom Line ~ it is in your best interest to be truthful. Don’t take the chance that your criminal past won’t show up. It will. Being proactive and taking the initiative to Self-Disclose will leave a much more favorable impression than if you let your employer find out only after the criminal check! Please Leave a Comment and Share this on your favorite social sites! Thanks! API can help you navigate the world of Employment and Background Checks. Visit our About Us and Background Investigation pages to find out more! Contact Us here for any questions you may have about Hiring, Security, and Your Small Business. We would love to hear from you!